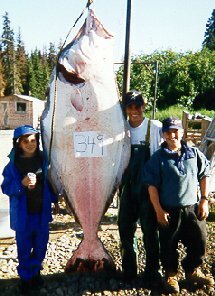 How Big of a Halibut You Ask For ! 349 Pounds of "Sheer Agony"
How Many Pounds Would You Like ? This is Our BIGGEST ! 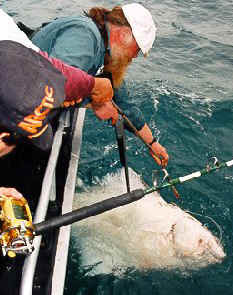 Truly ~ "A Big Ol Gal"
"Great weather, unmatched fishing, and thoroughly professional guides. A rare combination to experience in one memorable week. Thanks again for making our Alaska vacation the very best". 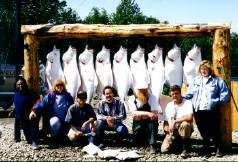 Our Halibut Fishing is in Cook Inlet from the "Deep Creek / Ninilchik area. 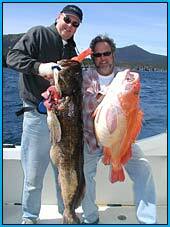 We also do some of our Halibut Fishing out of Homer. FULL DAY TRIPS For Your Success ! Full Days ~ A "Single" Trip per day. where it is kept with your salmon til your departure. A Batch of "Big Ol Gals"
You Get To Keep The Shell ! They'll Make a Lot of "Alaska Steak"
"Heaven On A Plate" & "Hell On Fishermen"
Call "Chick" Toll Free 888 434 7425 Right Now !